Once you have had a fabulous time onboard the mini cruise you then get to explore the beautiful city of Amsterdam or if you prefer one of the beautiful cities of Rotterdam or Bruges. The mini cruise includes return coach transfers to the city centre so it's easy to see the sights and visit the shops too. If you're sailing to Rotterdam the ferry port is located 37km from the city centre where coach links are available to take you to the city's central station where you can travel forward to Amsterdam. If travelling by car follow the N15 towards the city centre then cross the river north at the Benelux tunnel where you need to follow the A13 signposts which lead to Amsterdam. 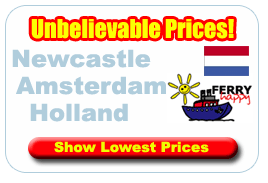 Travelling with P&O Ferries to Amsterdam you start your holiday as soon as you set sail & there's no stuck in an airport or cooped up on a train. Simply sit back, chill out and take in the fascinating sea views on a direct ferry which will really get you into the holiday swing. P&O ferry crossings take you to the gateways of Europe including Amsterdam with easy motorway access for your onward journey. By choosing P&O ferries you can take your car, caravan or motorbike on one of our cruises without paying any excess baggage costs whatever you pack. You may have loaded up your vehicle for a big family camping holiday, but even then you would'nt have to worry as it would all go free. Amsterdam is one of the world's most colourful cities & famed for its tree lined canals, chilled out atmosphere and fantastic museums. Stuck for something to do – not in Amtserdam, there's the Van Gogh Museum holding some of his greatest works & if you want to take in some of the Holland's own artists, such as Rembrandt, then why not visit The Rijks Museum. If you're more interested in history then a visit to the Anne Frank House would be just up your street. Plenty of time to spare? Then there's fantastic opportunity for shopping, dining out at some great restaurants & viewing the city as it was meant to be seen.